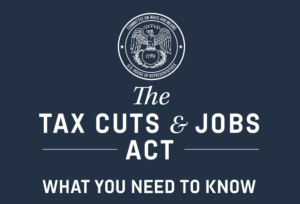 The Tax Cuts and Jobs Act is the most sweeping update to the U.S. tax code in more than 30 years. The reforms will simplify taxpaying for many individual Americans, lower taxes on individuals and businesses, and update the business tax code so that American corporations and the people they employ can be globally competitive again. The Tax Cuts and Jobs Act bill was passed by both the House and the Senate and signed into law by President Trump. The Tax Cuts and Jobs Act has the potential to unleash higher wages, more jobs, and untold opportunity through a larger and more dynamic economy. The bill’s pro-growth components include a deep reduction in the corporate tax rate, a scaled-back state and local tax deduction, full expensing, and lower individual tax rates. The bill also repeals Obamacare’s individual mandate, expands college savings accounts, and increases some non–growth-enhancing tax credits and deductions. Will the Tax Reform laws affect my 2017 tax return that I file in 2018? The new tax law will not impact your 2017 taxes, which many people will start filing returns for beginning in January 2018. These new changes will take effect when you file taxes beginning January 2019. Most provisions affecting individuals and businesses, such as new tax brackets, begin on January 1, 2018. Are there any Earned Income Tax Credit or the Additional Child Tax Credit Delays? Taxpayers who claim the Earned Income Tax Credit or the Additional Child Tax Credit may experience a refund hold. According to the Protecting Americans from Tax Hikes (PATH) Act, the IRS cannot issue these refunds before mid-February. The IRS expects the earliest EITC/ACTC related refunds to be available in taxpayer bank accounts or debit cards starting Feb. 27, 2018, if they chose direct deposit and there are no other issues with the tax return.Where’s My Refund? ‎on IRS.gov and the IRS2Go mobile app will be updated Feb. 17 for the vast majority of early filers who claimed the Earned Income Tax Credit or the Additional Child Tax Credit. Before Feb. 17, some taxpayers may see a projected date or a message that the IRS is processing their return. Taxpayers will not see a refund date on Where’s My Refund? ‎or through their software packages until then. The IRS, tax preparers and tax software will not have additional information on refund dates, so Where’s My Refund? remains the best way to check the status of a refund. Where’s My Refund? is only updated once daily, usually overnight, so checking it more often will not produce new or different results. Will I be getting $2000 dollars extra on my tax refund when I file this tax season because of the new Tax Reform Laws? No, When we file taxes starting in January 2018, we will actually be filing 2017 tax bills, so nothing will change. As soon as February, businesses will start deducting less from employees’ paychecks, and so there you will see a benefit, you will have higher take-home income when your employer is sending less of your money to uncle sam to pay taxes. Then, in 2019 when people are filing for 2018, which is this first year when tax reform will be going in, then that’s when they’ll actually see the simplification and possibly an increase in your tax refund. The penalty for not having health insurance remains in place for the 2017 and 2018 tax years. The penalty has been repealed beginning January 1, 2019. Child Tax Credit. The child tax credit, which helps parents offset the cost of raising children, will double from $1,000 per child to $2,000. The bill also makes up to $1,400 of the credit refundable. This means you can claim that portion of the credit even if your income is too low for you to owe tax. This is a credit, so it’s particularly valuable because it directly reduces your tax bill — not just your taxable income. Taxpayers don’t have to itemize to receive it. The credit will begin to phase out once a household’s adjusted gross income hits $200,000 for individuals or $400,000 for couples. An additional $500 credit is provided for each non-child dependent. Also, Social Security numbers for children are required before claiming the enhanced credit. Estate Tax. The exemption (currently $5.5 million) immediately doubles to $11.2 million in 2018 and remains at this level for the next six years, after which time the estate tax is eliminated completely (the tax year 2026 and beyond). Mortgage Interest Deduction. Remains but with a few changes such as allowing interest deduction for up to $750,000 (currently $1 million) in mortgage principal on new homes. Existing mortgages are grandfathered in. Homes entered into a contract before December 15, 2017, and closed on by April 1, 2018, are able to use the prior limit of $1 million. State and Local Income Tax Deduction. Preserved. The deduction allowed for up to $10,000 a year in state and local income or property taxes. Individual Healthcare Mandate. The penalty is eliminated for tax years starting in 2018.
Business Expensing. Businesses would be allowed to immediately write off the full cost of new equipment at 100% through the tax year 2022, after which it would be phased down over a four-year period. Pass-through Entities. The tax rate on pass-through business entities is reduced to a maximum of 20% for tax years starting January 1, 2018, and ending on December 31, 2025. Furthermore, a 9% tax rate (vs. the 12% tax rate currently in place) now applies for the first $75,000 ($37,500 for single filers and $56,250 for heads of household) in pass-through business income of an active owner or shareholder earning less than $150,000. The threshold amount is $75,000 for single filers and $112,500 for heads of household. This 9% rate applies to all businesses (subject to the $75,000 income ceiling) and is phased in at 11% for 2018 and 2019, 10% for 2020 and 2021 and 9% for the tax year 2022 and beyond. If you have any questions feel free to ask them below. We have been following the new tax reform laws closely. And as soon as new information is released we will be posting it here!